All beneficiaries will get the MITC (Most Imp Terms & Conditions) as part of the welcome kit. Also, the detailed T & C is mentioned in our website as well. 1. The Card can be used only in India and cannot under any circumstances be exchanged for cash. 2. The Card is Non-Reloadable in nature. 3. Card cannot be used at any ATM's. 4. If a Card is lost or stolen, the Cardholder must immediately report such loss/theft to Edenred? s 24 Hour Contact Center E-Assist (assist-IN@edenred.com) or 1860-233-5555* / 022-2545 5555 / 022-6143 3333. 5. Multiple Cards can be clubbed in 1 billing. 6. Validity - 12 Months from the date printed on the face of the card. 7. Cardholder and Corporate purchasers agree that the issuing of Card is subject to rules and regulations introduced or amended from time to time by the Reserve Bank of India or any other regulatory body. 8. Edenred (India) Pvt. Ltd. or YES BANK is not responsible with regards to the quality of the product / service delivered to the Cardholder by the Affiliate Establishment. 9. For security reasons, you will receive an inactive card. On delivery of your card, please place your activation request. - After receiving the activation request, the card is activated within 3 business days. 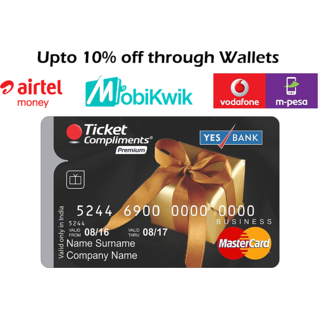 - To Activate the card please visit : activation.giftcardsindia.in Gift an additional 2% with every Ticket Compliments? Premium Your loved ones are special and they deserve something really special every time you gift them. So gift your loved ones the ultimate freedom of choice with the new Yes Bank Ticket Compliments? Premium Gift Card? Yes Bank Ticket Compliments gift card is one of its kind gift card which upon use provides a benefit every time one spends. 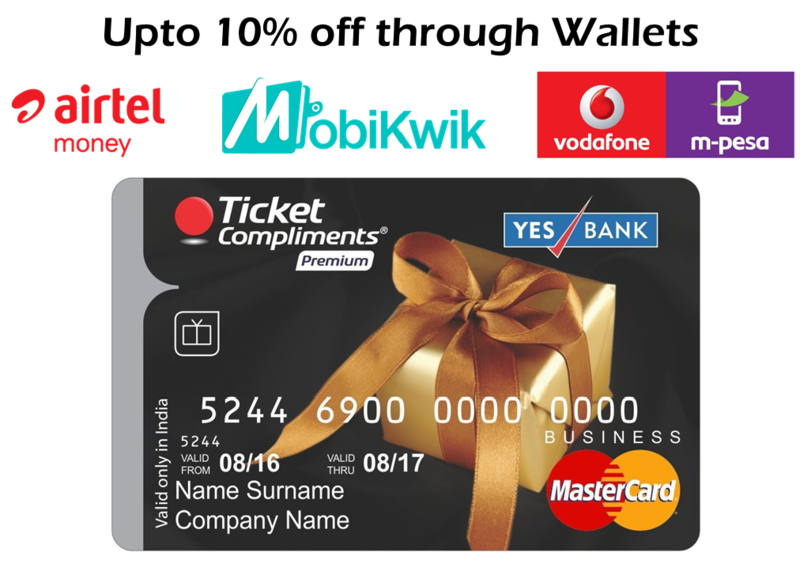 The card is not only accepted at million terminals (POS) and online stores that accept MasterCard, but also gets an additional 2% benefit* on every purchase at any of the select Ticket Compliments Premium affiliated outlets, such as Shoppers Stop, Star Bazaar, Lifestyle, Bombay Blue, Hidesign, Noodle Bar and many more Benefits of Yes Bank Ticket Compliments? Premium Gift Card: 1. 2% benefit* on every spend done at any of the select Ticket Compliments Premium affiliated outlets. 2. Freedom of choice as accepted at all MasterCard acceptance PoS terminals and Online portal 3. Wider acceptance network and cashback benefit 4. Convenient payment option. 5. Safe and Secure 6. Easily search for preferred benefit outlets in affiliate search page on www.edenred.co.in *Benefit will be provided by Edenred post settlement of the transaction by the outlet. Terms & conditions apply. Shopping on gift card has never been so rewarding.